Home > SHAVING ADVICE > What razor should you be using right now to get a smoother shave on a daily basis? In pursuit of ‘The Perfect Shave’ I’ve tried many different razors over the years. 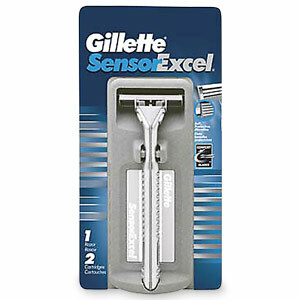 My first razor was the Gillette Sensor which came out in 1990. This was a simple 2 bladed razor and for my sensitive skin this done the best possible job at the time. To say it was an improvement over some of the disposable razors that were readily available at the time would be an understatement. …and how they survive to this day I will never know. In 1998 along came the Gillette Mach 3 razor. 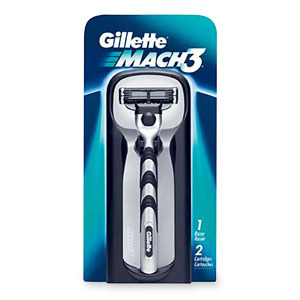 The big idea with the Gillette Mach 3 was that it had ‘3’ blades…not one…or two, but THREE! However, for those of us with sensitive skin, too close a shave was not a good thing. It just led to more irritation. 2006 saw the arrival of the first Gillette Fusion blade. Based on history, you might have expected this razor to have 4 blades. However…Gillette had produced a 5 bladed razor…or was it 6, if you wanted to count the single ‘precision’ blade on the back. Gillette told us that the blades were sharper, and they were closer together when compared to the Mach 3. 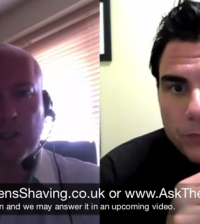 This meant a cleaner cut with less ‘drag’, resulting in…”The closest and most comfortable shave ever”. Whilst the first FUSION blade was significantly better than the MACH 3, I still found that it was aggravating my skin too much. Whether it was the blade, or their advanced shaving gels or balms, I just couldn’t fall in love with it, no matter how many times I gave it a try. I so wanted all of this research and development by Gillette to have produced the ultimate shaving razor…but it hadn’t…well, not yet. In 2006 not long after I had opened up my shaving shop – The Perfect Shave – I started to stock traditional doubled edge safety razors due to continued requests. I was amazed by the request for these things. To be perfectly honest, I didn’t know much about them at the time. I had saw the cheap looking ones in the local chemist or supermarket but that was about it. I thought they were a thing of the past. Something your granddad would still use…how wrong I was. So… If I was going to sell these double edge razors or safety razors as some people call them, I needed to know what the hell I was talking about. I spoke with a company called DOVO/Merkur, who were based in Solingen, Germany. From my own research they produced the best quality double edge razors available. After deciding to stock this brand of razors, DOVO/Merkur gave me some intensive training on them, as well as cut throat razors. I was good to go. In addition to the old school safety razors with varying short and long handles, they produced a couple of very modern looking models. They were called the Merkur ‘FUTUR’ and the Merkur ‘VISION’. And… In addition to their modern design and look, these razors had an adjustable razor blade. 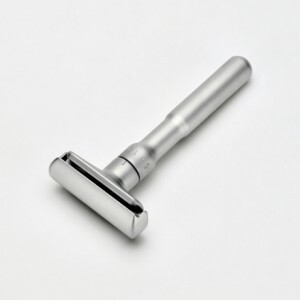 In summary, this adjustable blade allowed even a novice safety razor user – like me – to use these razors without the fear that you were going to cause a 2 inch scar on your face that would stop you from ever getting a job again. A weighted razor with proper balance is the ultimate when it comes to shaving. This is what appealed to me when I held both the Merkur VISION and the Merkur FUTUR models. Unlike the ‘old school’ safety razors which are normally very light to hold, these felt great in the palm of your hand. When shaving with them, the perfect weight meant that you were in full control of each stroke of the razor…you could control the exact pressure you were applying to the skin during the shave. Over time I decided that the Merkur FUTUR razor was the best out of the two. The Merkur VISION in my eyes (excuse the pun) is a little too big and bulky…whereas the Merkur FUTUR is perfectly weighted and is a great size in terms of handle length. I still use the Merkur FUTUR razor today when I have time to enjoy my shave and I am after the closest shave possible. However, this is not my daily razor of choice at the moment. 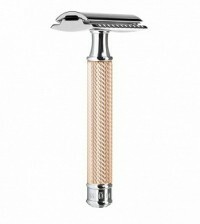 Like many of us, we don’t have the time in the morning to enjoy a close shave using a safety razor. We want to shave and get out of the door as fast as we can most of the time. My choice of razor today may surprise you… But this short personal history lesson was here for a reason. I wanted to give a few clues as to why I use what I do for my daily shave as of writing this post. The razor that I am currently using to shave with every day is the Gillette FUSION Pro Glide Styler. 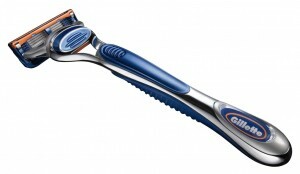 Well, since 2006, Gillette has produced several updates to its FUSION blades. Each one slightly better than the one before. As you would expect of someone who has been in the shaving industry for the past 8 years… …I test everything. And…when Gillette produced the FUSION ProGlide razor blade they hit a home run when it came to razor blade technology. It may have taken them 6 years but they finally did it. The FUSION ProGlide blades have the thinnest and sharpest edges of any FUSION blade.They also have a low resistance coating so that the blades glide through your facial hair more easily. They have no weight to them, and the resulting balance is poor. It’s like holding a lightweight pencil. Because of this, I always find you end up applying to much pressure to the skin when taking each shaving stroke… …and this leads to all sorts of problems, including razor burn and ingrown hairs. However, when I saw this big bad boy FUSION ProGlide Styler I got excited…mainly because of the size and weight of the handle. When you hold this razor in your hand for the first time it feels great. It has perfect weight due to the fact it has motors built inside the handle to power the ‘styler’ aspect of the product. You only have to apply the slightest pressure onto the face of your skin when shaving. The amazing weight of the razor allows the blade to glide down your face and neck with total ease. Your facial hair offers no resistance at all. In combination with the FUSION ProGlide razor blade – this is the best shaving razor possible right now in my opinion for daily use. It is a little expensive due to the fact it is a 2 in 1 product, but the cost is definitely worth it. 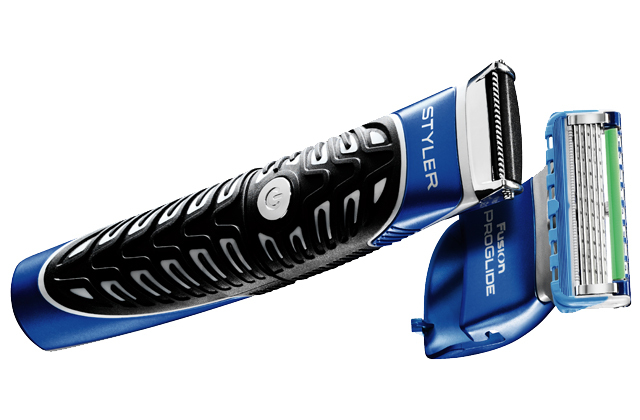 If you shop around, the average price for the Gillette FUSION ProGlide Styler is somewhere around £20. Key Learning Point: I’ve mentioned it a few times in this post, but the weight and balance of your razor should be one of the key factors you take into account when buying any razor. 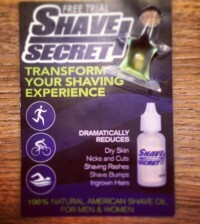 It really does make a massive difference to your shaving results. In an upcoming post I am going to talk more about Gillette’s latest shaving gels and balms. Have Gillette learned something from their purchase of The Art of Shaving in 2009? Ok… So I have told you what my razor of choice is right now. Do you agree or disagree? Let me know. What razor are you using right now that is giving you the best shave? 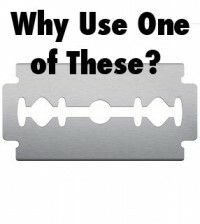 Have you found that one razor that works best with your skin type compared to another? Share your views with our growing community. Simply post your comment or question below and I will try and respond personally. Click here to subscribe and get exclusive Mens Shaving content that you cannot find here on the blog, as well as free access to my eBook, “The Complete Beginners Guide to Shaving Brushes”, which has been downloaded over 2,000 times! Well, you can’t go wrong with a Merkur safety razor. I would recommend anyone deciding to give safety razors a try to go for a Merkur. Your chances of being disappointed about safety razors will be somewhere around zero. Hi Sue, thanks for getting in touch. May not be the obvious answer, but I would highly recommend The Art of Shaving brand for anyone getting into shaving. It does cost a little more than your normal high street brands but the investment is well worth it. PS: The shaving brush will help greatly with getting rid of all of the hair – I know he is only 17, but if you can get him to try he will see the benefits. I agree on the manual razors that you’ve talked about in your post above. The Merkur is truly a great piece, having that perfect balance. I second that. The Merkur is a great option. I’ve been using the Schick Hydro 5 for several months because it outperforms all the Gillette razors I’ve tried. The first time I used the Hydro 5 I thought it was incredibly strange because of the oozing gel it left behind each stroke, but then I discovered it reduced irritation & friction if I needed a second stroke on a particular area, which was leaps and bounds beyond the Gillette razor I was using before. As far as post shave balms, I used to use Nivea products, but I got to thinking they left my skin too oily, so I switched to Gillette Intense Cooling Lotion. It feels nice initially, and it does moisturize my skin, but it seems to get runny around about the time I get my undershirt on to get dressed. I guess I’ll be checking out your opinion on post shave balms in the next post. Thanks for the comment. Agree with everything you said. Merkur razors are amongst my favourites. 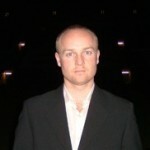 Used to have a VISION and a FUTUR, but as I mentioned in the article, the FUTUR won me over in the end. If I have the time I use the FUTUR, but in general, my day to day razor at the moment is the FUSION pro-glide styler. I have been using Merkur for a decade now and I must admit, its a pleasure to shave. As mentioned in the post above, the weight and balance of the razor is absolutely amazing.